Upon Phil’s passing, I made two personal commitments.The first is simply to honor his parents the best I can. In this, I have called them each year on December 7th to check in and express my love and gratitude for them. Additionally, I try to stop by to see them during my sporadic visits to Atlanta. To this day, I am richly blessed by Mr. & Mrs. Clarke’s friendship towards me. The second is what this post is about. Upon Phil’s passing, I committed to getting away by myself around December 7th every year to simply think about Phil, his life, and what I have learned from him and his untimely death. I think, pray, ponder, journal, and remember this friendship which had meant so much to me and at such a crucial time in my life. It is always a painful time, yet rich in fellowship with my Savior, Christ Jesus. It is a time I ALWAYS genuinely look forward to. Though I miss my friend in so many ways, I am still learning from Phil Clarke, his life, and his death at 22 years old. I was 24 at the time, and much of what I have learned from Phil has shaped everything I have done, decisions I have made, and even places in which I have lived since that day. Upon the anniversary of Philip Andrew Clarke’s passing some 18 years ago this week, I have retreated to a local Asian coffeehouse. This post is about SOME of what Phil’s life and death have taught me and how it has formed my thinking. There is something powerful about having a best friend in heaven. Not that I didn’t believe in heaven prior to Phil’s passing, but the tangibility of heaven was immediately hammered into me after his death. Phil was gone. However, it was and is 100% clear to me that he is in heaven right now. In addition to the comfort I have regarding Phil with this reality, it is also of great encouragement in my own life. Phil is in heaven. I WILL be there one day. No matter what comes my way, I can push through with this reality. Life is hard, but the presence of this reality of heaven makes any and all trials and travails temporary. Therefore, I can press forward knowing clearly my ultimate destination will make it all “worth it” in the end. Phil’s presence in heaven RIGHT NOW has been a powerful, calming element in my life from that day forward. Much like the first point, Phil’s early entrance into heaven has been a constant, tangible reminder that life is temporal AND short. I knew back then, as I do to this day, that whether it is today or 70 years down the road, I will eventually be where Phil is now. Additionally, this time will be upon me in a flash. I look back now and I CANNOT believe it has been 18 years since Phil’s passing. In many ways, it seems like yesterday. I still remember those exact days surrounding his death in vivid detail (CLICK HERE). As a result, I really want to “run the race” well. I know this world is but temporary. This life is about preparation for the next life. This is life is temporary, but the next is for eternal. Lord Jesus, please allow me to be a good and faithful steward of the days you provide for me. I have always believed this. However, the experience of having a friend die in an accident has made this fact all the more real. For this, I am grateful beyond words. Philip Clarke loved the Bible. He staked his life upon it. I have learned from Phil in this. I am trying to do the same. Phil loved people and honestly wanted to simply “invest his life” in others. My last evening with Phil was the Tuesday night before he passed on a Thursday morning. We ate dinner at Fellini’s Pizza with a friend who worked for Intervarsity at Emory University. I will never forget sitting there listening to Phil articulate his life passions. Phil was animated and enthusiastic as he shared. It is funny, as I had heard him say similar things often prior to that night. However, that evening, the last meal I would share with Phil, was the first time I had just sat back, listened, and appreciated who Phil was as my brother in Christ. I was inspired. To this day, I can remember where I was sitting and in what booth there at the Roswell Road Fellini’s and all of the details of that time. Phil’s legacy in my mind was cemented through the values he communicated that night. He spoke through the clarity of the Bible, God’s Word. He spoke passionately about the spiritual condition of those in the world around him. Phil Clarke’s life hammered home to me the reality that there are only two things of eternity in this world; God’s Word and the souls of man. Though Philip Clarke lived a very short time period, his impact upon this world is incalculable. As I stated in my previous post, I am amazed how many people to this day want to talk about Phil and his impact upon their lives. Even more so, I am amazed at the many wonderful lives of those of us closest to Phil have lived and are still living, both in Phil’s direct family and those of us who were privileged enough to call him a friend. As for me, these three “life lessons” have meant everything to me and the man I am becoming. For this lasting legacy of Philip Clarke, I am eternally grateful. Though many of us still miss him, I am grateful beyond words for the impact his friendship and brief life are still making upon me and many others. Thank you, Lord Jesus. For even in the pains of death, you are sovereign, good, and loving towards those most affected. Thank You John, for sharing your heart &keeping Philip’s memory alive. You are a tremendous Blessing. Love this photo & i had not seen this one. Great hearing from you Mrs. Clarke! Yeah, I think I must have been holding the camera. I really like this pic a lot. Love you and talk to you guys soon! What a beautiful and heart warming story of your friend Philip Clarke. I did not know Philip but I have known his Mother since we were 5yrs old and I love her dearly. Reading about his life and the love he had for the Lord Jesus is so moving, I know he was a remarkable young man. The friendship that you two shared is so real and it just brings me to tears to see how much love and respect the two of you had for each other. Thank you for sharing your memories of Philip, I enjoyed it more than you will ever know. Philip is now in Heaven serving the Lord Jesus while you are on earth doing the same. Hugs and God Bless You. Thanks Jane. . . always great hearing from you! Tears flowing as I read this. So rich and poignant. You are but on Christ’s side! Philip was such a beautiful, fragrant flower in your earthly garden….and his fragrance and beauty still lingers. As we celebrate the birth of our Savior and await the King of glory, may His wondrous love fill your spirit with all His blessings. Thanks again for sharing your heart so transparently with us. Philip was obviously a man of God who left a lasting legacy for his family, friends and even strangers. It is very touching that you continue to honour his life the way you do. What a beautiful and truthful poem! Thanks for sharing. Thanks and I agree about the poem! Beautiful poem. . . thanks for adding it here to this post. I am so sorry for your loss, even now. I know it must comfort your heart that you know your friend really is alive and that you will see him again. I know that will be an incredible remeeting of true joy. I am so glad you still remember Phil’s family. I am sure that brings them so much comfort and love. I know this probably occurred to you years ago, but it struck me how both of you shared names with two of the original disciples! Very cool-another level of your brotherhood. I also love the idea of investing in people-trying to make their lives better and helping people feel seen and valued. Its what matters, right? Loving people. Loving God. I hope your heart is comforted, even now, as your reflect on your friend. Thanks Stephanie! Actually, our pastor at Philip’s funeral shared about the apostle, Philip Andrew. Great correlations! Thanks for sharing this John. I have benefited from Phil’s life in some of these ways too. Even after all these years, Phil life and legacy is bringing students at Georgia Tech to faith. 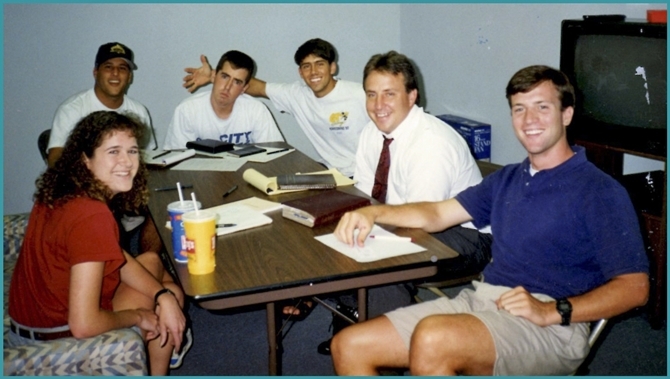 A steady stream of Christ-centered leaders has been the fruit of the seeds of Phil’s life. Our brother Troy now carries that torch at Tech. I am thankful for season I had to be a part of it. Your point about heaven actually struck me as extremely relevant for many people right now. Here is why; in many Christian circles over the past 15 years there has been a strong emphasis on the fact that eternal life with Christ is not just in heaven, but also on the new earth. At least for me personally, I may have over corrected my hope. God has given us something beautiful and simple in our assurance that if we truly trust Jesus, we go to heaven when die. The new heavens and new earth complete a picture and shape me, but the immediate prospect of heaven is real and absolutely needed. It brings joy to think that Phil is absolutely loving that truth right now!! Wow, spoken like the gifted communicator and pastor you are! Thanks for adding this in. I totally agree. Like always, we seem to over correct and then over correct our over corrections. This does seem to be one of these. Thanks, brother, and I hope you guys are having a great holiday season! I can’t imagine losing my best friend…I’ve known her since I was almost three years old. What God has shown you and done in your life through the loss of your dear friend is truly beautiful and a testament to His grace. You grieve with much hope. Prayers for continued comfort to you, John. Amy. . . “grieve with hope”, I like that. Very applicable! Once again, your heart is laid bare on the screen. What a beautiful tribute to your dear friend, Brother in Christ and to a man whom life lived with purpose! It’s been lovely to read what your other friends have contributed in this post as well. It seems the influence of Philip’s life ripples on to this day as you and others are proclaiming Christ and living and leading in The Way. Grace & peace to you, John…especially during this time of remembrance. Thanks Alexis. Yes, I am also amazed that a man of such a short life was able to have such a strong and lasting legacy. Phil was a wonderful guy and I feel blessed to have run with him for that time period. I have known of Phil Clarke for many years with the scholarship fund which has benefited many Tech students and reading this post makes me realize how crucial friendships (like this one) should be for all of us. What a blessing that at 22, God had already provided you with a lifelong friend that shapes you even today. May we look at all the friends in our life as life givers and may we be that man to others. Thanks John. We love who you are…and it seems that Phil had a lot to do with that. Thanks Tom for adding this in here. Yeah, I continue to be amazed how how lasting memories of Phil and how present his impact is still felt. Miss seeing you guys. . . give the family my love!